Intel CPU prices going up? news pundits saying otherwise. "Apparently" is another guess. includes wasted space along the sides of the wafer. and if it wants an octa-core, it just gives you two of them! I think the Ryzen is a single die with two CCX on it. So your yield is for an 8 core chips. lot of features similar to MCM's. Looks like one silicon die to me. There are two IP blocks on it. graphics in a single piece of silicon. Die shot of the mobile part, with one CCX on the left, GPU on the right. 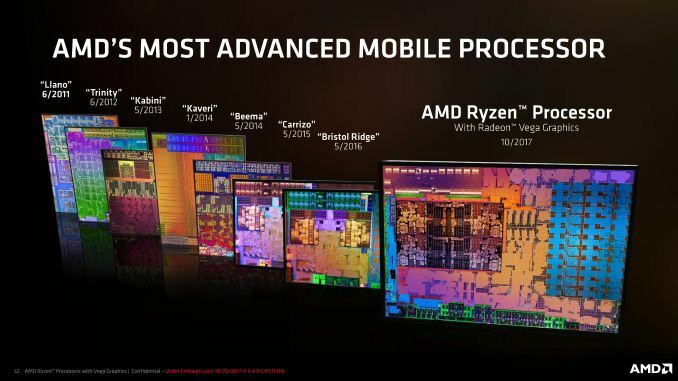 The Ryzens use 4-core CCX's, while the Threadrippers use 8-core CCX's. And that's exactly what my quotes above, provide. block size is a 4 core CCX, which is getting reused. There is a grand total of two die designs. some of the more profitable packaged products. architectural shortcoming, not a "snip point". The die is one continuous thing.